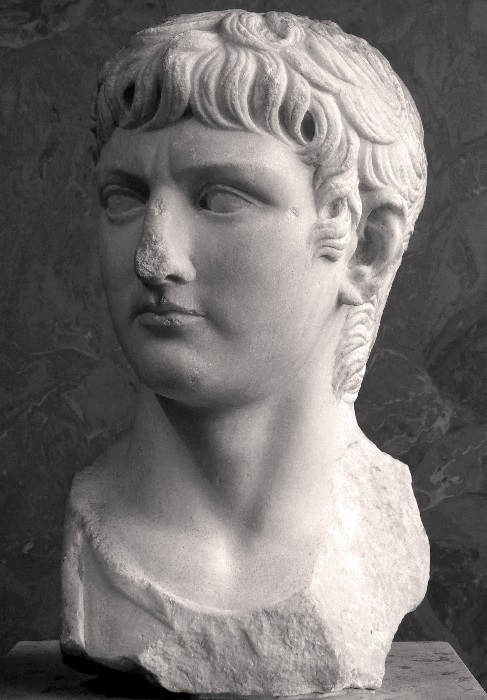 Germanicus was the elder son of Nero Claudius Drusus and Antonia and therefore represented the first potential heir from the combined Julio-Claudian bloodline. 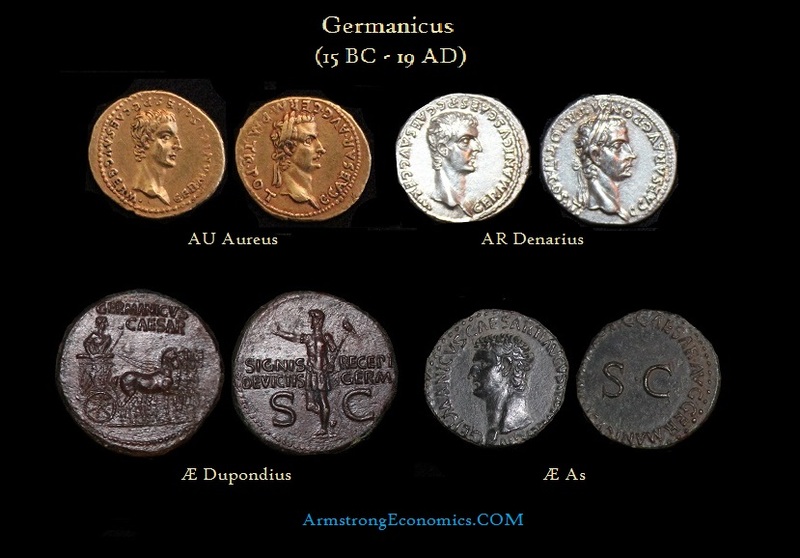 Germanicus was born in 15 BC and was adopted by Tiberius in 4 AD at the time Tiberius himself was adopted by Augustus as his ultimate heir. Germanicus possessed all the highest qualities of body and mind, to a degree never equalled by anyone. A handsome person, unequalled valor, surpassing ability in the oration of Greece and Rome, unexampled kindliness, and a remarkable desire and capacity for winning men’s regard and inspiring their affection. Suetonius portrays an image of Germanicus which is beyond probability. 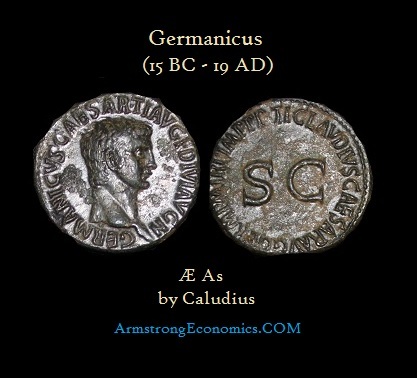 The reality of Germanicus was much less perfect, but given the emotional tide of the period, the favoritism history has shown toward Germanicus is understandable. We must keep in mind that Augustus ruled as Emperor for nearly 41 years. This is certainly time enough for the generations to come and go. Therefore, the rule of Augustus was similar to the first 40 years following World War II where peace prevailed for the most part and prosperity filled the land. In this context, the young Germanicus appeared very much to the people as did John F. Kennedy in modern times. And like Kennedy, who became more perfect after his assassination, so did Germanicus in his time period. If we look beyond the legend and into the history of the man we see very much a young dashing politician who perhaps represented to the people the dawn of a new generation. Germanicus was married around 8 BC to Agrippina, the daughter of Agrippa and Julia. Agrippina was a very outspoken woman who accompanied her husband on all his campaigns and bore him five sons and three daughters, one of who would become the future Emperor Caligula. Their daughter, Agrippina Junior, became the mother of the future Emperor Nero. 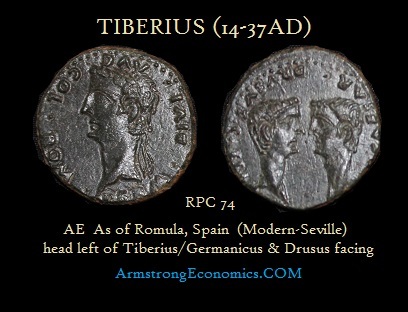 When Tiberius came to power, he emphasized his heirs being Germanicus and his own son Drusus as illustrated above. Both Drusus and Germanicus played important roles in suring up the support for Tiberius following the death of Augustus. 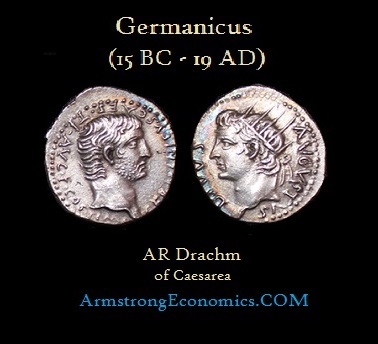 Drusus was sent to settle the unrest among the legions in Pannomia while Germanicus’ first major role in history was to suppress the mutiny of the Rhine legions. Tacitus claims that the soldiers offered to make him Emperor instead of Tiberius, but again in reality the troops merely wanted higher pay and better conditions. Germanicus was not able to simply solve the problem. However, he had taken his wife Agrippina the Elder and their family along with him to the frontier. When the situation became dangerous Germanicus was forced to order his wife to leave with the children. Her departure so shamed the mutineers that the revolt quickly subsided. It was actually during this campaign when the future Emperor Caligula was born. Germanicus’ popularity was indeed very much enhanced by the actions of his wife. During another campaign against the Chatti and Germanic tribes, Agrippina worked personally to prevent panic from spreading among the legions stationed in the encampment on the Rhine. She worked distributing food and clothing among the inhabitants and gained much popularity among the Roman people for her actions. Germanicus remained with the Rhine legions between 14 and 16 AD. He did lead the legions deep into Germany in successive campaigns and managed to recover two of the three legionary standards lost at the Teutonburg Forest byQuintillius Varus. He also buried the remains of whatever Roman dead he encountered. In reality, Germanicus was at best a moderately competent general but his second campaign into Germany nearly ended in disaster. Tiberius recalled Germanicus to Rome and gave him a splendid triumph on May 26th, 17 AD. This was perhaps more of a propaganda event on the part of Tiberius to win popular support. However, it was during this period where the emotional support for Germanicus became quite noticeable in Rome, which caused some concern at court. Perhaps by the design of Livia, Tiberius’ scheming mother, Germanicus was ordered to the East in an attempt to remove him from Rome. 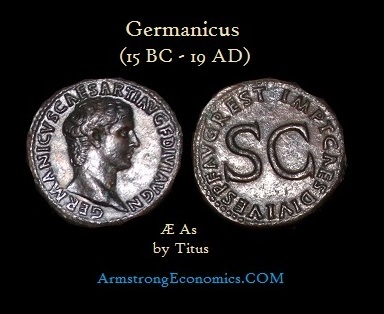 Tiberius also appointed Germanicus, his colleague, as consul in 18 AD, which marked Germanicus as the chosen successor. 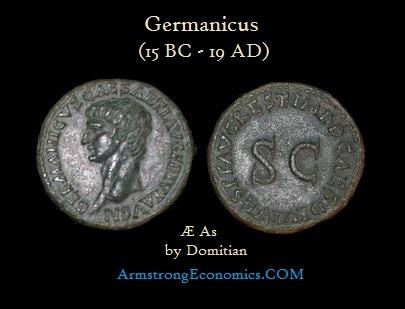 Germanicus departed Rome for the East shortly after his triumph in 17 AD. While at Antioch in Syria, Germanicus came into conflict with Gnaeus Piso, the new governor of Syria and friend of Tiberius. Germanicus clearly over stepped his authority by visiting Egypt without imperial permission. When Germanicus became ill and died at Antioch on October 10th, 19 AD, his wife Agrippina insisted that he had been poisoned by Piso. Agrippina marched to Rome and held a funeral procession for Germanicus and openly accused both Livia and Tiberius of ordering his murder. Tiberius was forced to put his friend Piso on trial. In the end, Piso was compelled to commit suicide, but Agrippina insured that suspicion toward Tiberius would never disappear. Note: All the coins bearing his name and portrait were struck about twenty years and more after his death.